So who do you ask to get all the details and quell the rumors? Why, you go right to the top! Sega-16 recently sat for a spell with former Sega of America president Tom Kalinske, and the wealth of information he had to share was astounding. From the company's internal rivalry to the missed chance Sega had with Sony to develop a joint console and everything in between, Mr. Kalinske shed new light on everything Sega! Want more info? Then check out our exclusive, in-depth interview and see how it all happened! Last edited by Melf; 09-09-2011 at 10:09 PM. Sega-16: That sounds a lot like what happened with the Sony/Nintendo CD-ROM. Sony was willing to enter into a joint hardware platform but was ultimately rejected by Nintendo in favor of Panasonic. Panasonic!! It should be Philips (Panasonic was too busy supporting the 3DO). EA and 3DO was founded by the same guy, so that's why EA supported the 3DO with a lot of software. But you should have said that the 3DO co. supported the 3DO hardware because it was the 3DO co. who made the hardware. But companys like Goldstar/LG, Panasonic, and Sanyo (in Japan only) are really the ones who sell the hardware under their own band. Actually, 3DO's business model was to not even support its own platform. It would produce the the hardware, and other companies would make variations, as well as software. That's why it had so many problems, I think. Maybe Trip Hawkins will discuss that when he returns my interview questions. Problem is that EA only made software, so why you said that EA suppored the 3DO as a hardware maker? You should just put down Trip Hawkins as the main guy who supported the 3DO. EA wasn't the main software maker for the 3DO; there wasn't one. Hawkins' business model was to create a hardware standard and license it out to electronics manufacturers. EA obviously made games for the platform because it was the principle backer of the whole project. They weren't planning to be to the 3DO what Nintendo and Sega were to their consoles in terms of 1st party software though. I enjoyed the interview, just a small note that in the second question's answer the quotation mark on "wow, we've got this all wrong" isn't closed. Excellent interview. Phone interviews are always the best because you can react to an answer and do a follow-up question which is impossible in e-mail interviews. The article should be linked to this thread for those wandering in who want to discuss it. I never thought I'd see a new Kalinske interview about his days at Sega. Color me impressed. Good read, although I kind of wish you'd asked more questions. In particular, I'm burning with curiosity about that Donkey Kong Country statement. It's clear that your next interview should be with Joe Miller. Last edited by j_factor; 07-11-2006 at 03:07 AM. Yeah, I actually had a few more questions, but he was on his way to a meeting so we got cut short. He didn't seem to really want to discuss DKC though, as it was likely one of the few things he wasn't spot-on about when he was at Sega. "So what's the deal with those crappy paper boxes? You had really nice, plastic clamshell boxes and then you went to cheap-o cardboard which gives everyone in the world the illusion that you are losing money uncontrollably and are not financially stable. Japan kept using the nice plastic clamshells even though the Mega Drive only sold 1 unit per week (or so). So therefore it couldn't have been that expensive. And introducing the 32X system with games in paper boxes? No, no, NO! 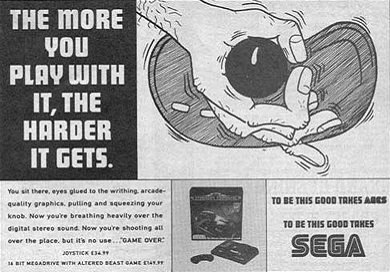 I would have given the gamer more for their money, shown them that Sega products ARE of higher quality. Explain. NOW!" It's as if the more money they made, the less they wanted to spend. Last edited by Joe Redifer; 07-11-2006 at 03:36 AM. Very cool interview! I was pleased to see that Mr. Kalinske had volunteered to talk to Sega-16. I knew (through reading EGM, GamePro, Sega Visions etc) back in the day that Tom Kalinske was the president of SoA and that he was one of the people most responsible for the success of the Genesis here, but I didn't realize just how much he personally had contributed to Sega's success in the U.S. nor that he had encountered so much resistance from SoJ later in his career with Sega. Also very interesting to know that Sony and Sega had almost collaborated on a console. I'd love to see more interviews like these: people I've actually heard of and admire, like the interviews with Boris Vallejo, Dave Perry, and Victor Ireland. Keep up the good work, Melf! Love the site! I'm not sure how to answer your question. But it'll all be OK. Excellent interview, Ken. It would have been nice if he had time for a few more questions, but the answers that he did give were intersting. His answer to the last question reads "...in the consume products area..." I may be wrong, but I think it should read "...in the consumer products area..."